We had just got back seeing Toy Story 3 in the theaters. The movie was followed by a brief playtime in the fountains at the harbor side – the kids had a blast running around cooling off as the fountains drenched them with gallons of water. A sudden baking urge in the afternoon and a need of some fresh cool flavors in this typical Texas summer, created the cupcakes. These are the cupcakes in the basic form but with robust citrusy flavor. If your inclination is towards a light chocolate free one, use the recipe but omit the chocolate. The recipe here is the second time I made these, and I added chocolate for the kids. The first time the cupcakes were baked with only plentiful orange zests and no frosting/icing at all, it was an instant hit with A and me; while the kids ate a few once they came out fresh from the oven, they soon remembered to whine that the cupcakes without chocolate or icing are “ugly muffins”!! How dare? I wondered, but I cannot think like a child anymore. 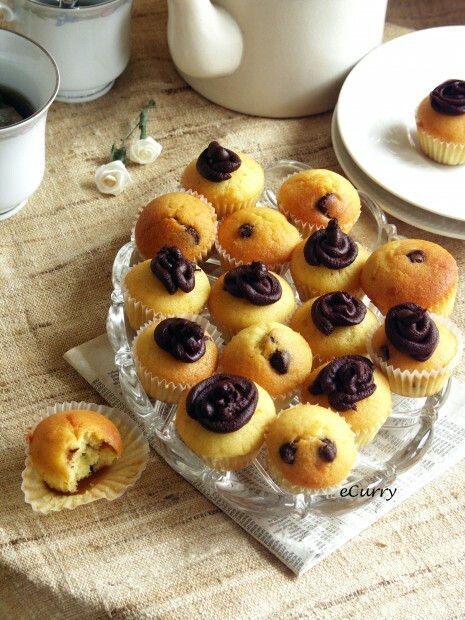 The second time, I scantily topped a few of them with plain melted chocolate (no gooey high icing ), and that seemed to turn the ugly muffins into joyful cupcakes, more so I suppose because of all the chocolate bites that they looted inside. 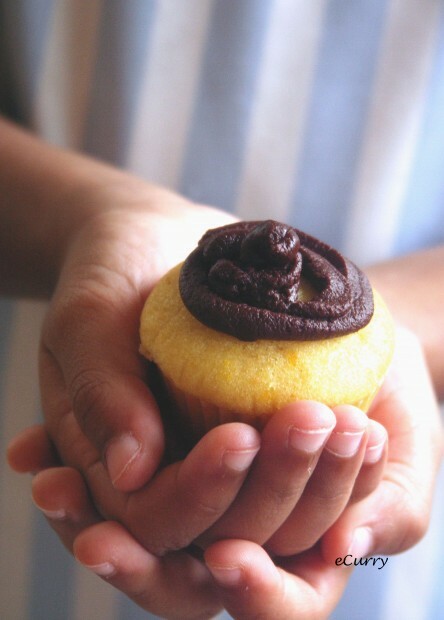 The cupcakes were baked in mini muffin cups, just right for kids. Both versions were good, tho’ A and me liked the one without the chocolate or the frosting. I do not usually make up any baked dessert recipes on my own, but this time I did and it worked with stunning effects; perfectly done, fluffy and moist and I cannot speak enough of the fantastic orange flavor. The recipe is uncomplicated – almost like a basic cake recipe, and it barely takes any time to make them. Whisk in flour, salt and baking powder; add the zest and rub in to the flour with the finger tips to release the oil in the zest. Whisk butter and sugar till foamy. Whisk in one egg at a time. Add the vanilla extract and whisk it in. At low speed beat in the flour, cream and the orange juice a little bit of each at a time.. .kind of like alternating them.Beat/whisk at low speed till well combined. Scrape the sides of the bowl. Dust the chocolate pieces/chips with flour and gently fold them in right before you fill in the cupcake liners. Pour the batter in to the cup cake liners till they are 3/4 full. bake for about 15-18 minutes or till the toothpick comes out clean and the top is golden. Combine the chocolate and the cream/milk in a bowl and melt the chocolate in a double boiler or microwave. Combine the orange extract. Quickly pipe it on the cupcakes. I used an ziplock bag, no fancy piping tool. In their petite size, spongy and full of flavors, they did not last for too long. Cute and irresistible and very easily satisfies a snack time and tea time cravings. These are on their way to SHF #69, this time hosted by Aparna of My Diverse Kitchen. The Theme is Bite Size Dessert. Gorgeous looking cupcakes, Soma. You have tickled that sweet tooth in me with these little delights. your pictures are always a treat for eyes and a inspiration to me Soma. 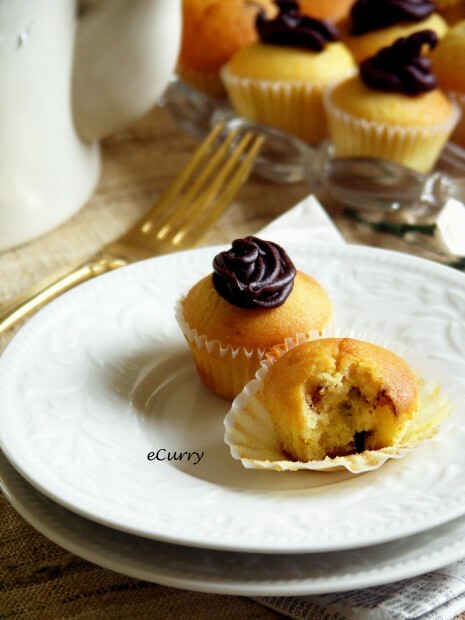 awesome clicks and very good recipe too. 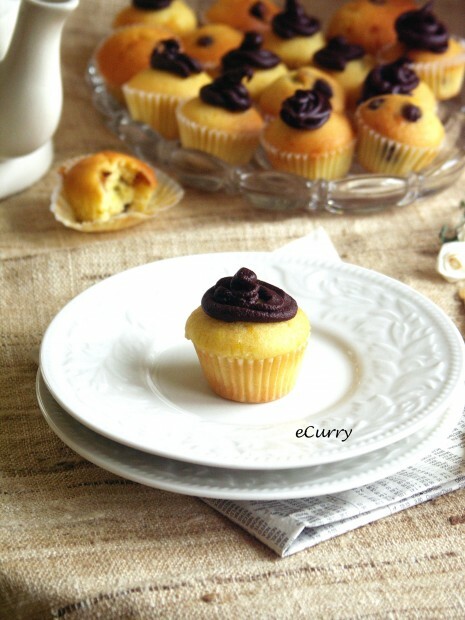 truly tempting cupcakes,,light and fluffy…wonderful pics and presentations soma…perfect for sweeeeet tooths…….bravo girl.. Your pictures are so beautiful and love the combination of chocolate with orange. A refined flavor combo! Those must taste wonderful. 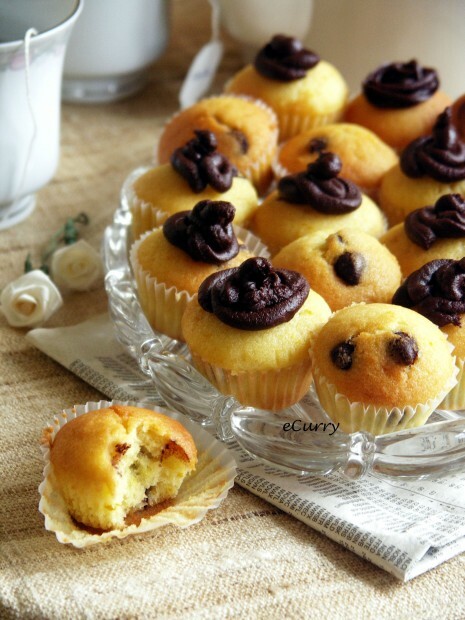 Perfect fluffy cupcakes u’ve got! They look so cute and delicious. I could really use one as a study snack right now :). Thanks for sending them to SHF: Bite Size Desserts. Haha.. I know some adults also who think that cupcakes without frosting or chocolate are muffins. 😀 Just the mention of orange and I can almost smell the cake! Will keep both versions in mind. Cheers! Excellent story and chocolate chip cupcake recipe, thanks. I also found that a bit of citrus zest in chocolate chip cookies is quite good. Don’t be too heavy handed with it though as just a hint of that delicious orange flavor is plenty. Soma, loved the clicks..the cupcakes are truely very tempting….just one thing to ask …which brand of chocolates do you use??? Ghiraldelli semi sweet or dark chocolate.. sometimes Nestle. Both are available in the baking aisle of the grocery stores. 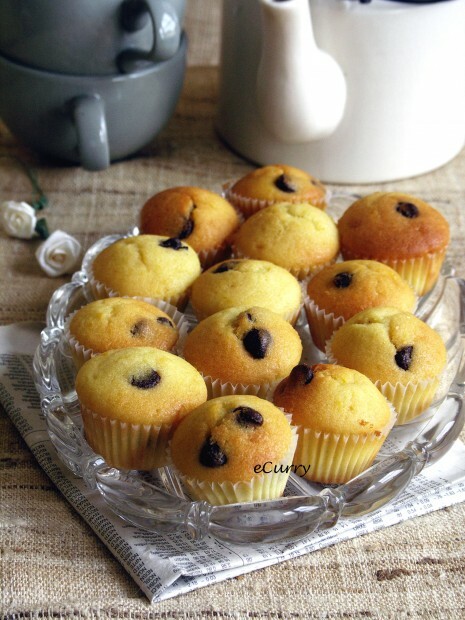 meghla meghla ghum ghum bikel hoyeche .. mon ta chaa chaa korche … ar eto shundor cupcakes theke ekta jodi petam … aha. Little cuties look gorgeous, Soma. They’re such a cute size, and the mix of chocolate and orange is a great one! How cute are these cakeS!! Chocolate and orange are a terrific combination! Yummy cute cupcakes! Love how dainty these look. Plus, you can never go wrong with the combo of chocolate and orange. Just came across your blog via My Diverse Kitchen. What stunning cupcakes and great photos – and you’re a neighbor of mine. I’m also in the Dallas area! Hello, I tried this chocolate cake recipe few hours ago but somehow couldn’t achieve the same result as you, my cake really wasn’t looking that good (atleast it tasted good). What kind of chocolate are you using? Maybe it’s because of the flour I used, i’m gluten intelorant so I used chickpea flour instead of normal wheat flour. I use Girardelli Semi Sweet or sometimes Nestle. it is not the chocolate. I think it would be the texture of the chickpea flour. Not sure if using almond flour or quinoa flour or fine semolina flour would make it better. All these flours are however grainier than the regular wheat flour.And the main texture of the cake does not have much chocolate in it. I would think it is the texture of the flour that made a difference.